WASHINGTON – Pope Francis has appointed Father Roy Edward Campbell Jr., who is pastor of St. Joseph Church in Largo, Maryland, as an auxiliary bishop of Washington. The appointment was announced March 8 in Washington by Archbishop Christophe Pierre, apostolic nuncio to the United States. Bishop-designate Campbell, 69, has been pastor of St. Joseph Catholic Church in Largo, a Washington suburb, since 2010. He is a member of the archdiocese’s clergy personnel board, the vocations board and the college of consultors. Raised in the Washington Archdiocese, he worked in the retail banking industry in the Baltimore-Washington area until taking early retirement in 2002. The following year he entered the seminary to study for the priesthood. He was ordained for the archdiocese by Washington Cardinal Donald W. Wuerl May 26, 2007. The appointment was a surprise, Bishop-designate Campbell said in video posted on the archdiocesan website. “It is a great honor that the Lord himself has bestowed upon me through the Holy Father and quite honestly through our archbishop, Cardinal Wuerl. But it is also very humbling,” he said. “The only thing that I was looking forward to doing in answering our Lord’s call is to be a priest for his people, to love and serve those he’s called me to, his children, my brothers and sisters. And if he is calling me to serve on a larger scale than a parish as a bishop, then I know I will have his grace, his direction and his love to help me do so,” he said. The road to the priesthood for Bishop-designate Campbell began in late 1995. Leaving work in Baltimore, he met a person on the street asking for food and took him to get something to eat, according to his biography on the archdiocese website. In 1999, Bishop-designate Campbell entered the archdiocese’s permanent diaconate program and four years later entered Pope St. John XXIII National Seminary in Weston, Massachusetts, to begin his priestly formation. Bishop-designate Campbell was born Nov. 19, 1947, in Charles County, Maryland, and grew up in Washington. He said his mother’s devotion to her Catholic faith demonstrated the importance of having deep love of God in daily life. He pursued degrees in zoology, anthropology, chemistry (1965-1969) and bank management (1992), before entering the seminary. 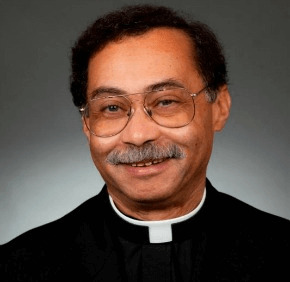 After his 2007 ordination, his assignments at Washington parishes included: parochial vicar at St. Augustine Church, 2007-2008; pastoral and sacramental care of the African-American community at Immaculate Conception Parish, 2007-2008; and pastor at Assumption Parish, 2008-2010. The Archdiocese of Washington covers the District of Columbia and five Maryland counties. Out of a total population of over 2.5 million people, about 647,000, or 22 percent, are Catholic. Cardinal Wuerl has been the archbishop of Washington since 2006. The archdiocese currently has two active auxiliary bishops, Bishop Barry C. Knestout and Bishop Mario E. Dorsonville, and one retired auxiliary bishop, Bishop Francisco Gonzales Valer.